English prolific author and crime writer. Creator of King Kong. Approx 9.5 x 7.5 inches. Gelatin silver print by Cyril Stanborough, signed in negative by the photographer and with his rubber stamp on verso. Slight mounting traces at top and bottom edges of verso and with slight silvering to edges of image, else fine. 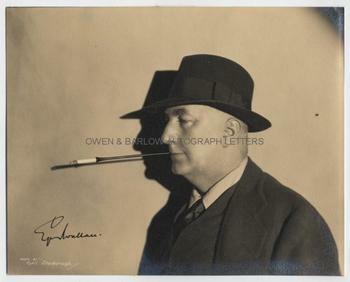 An excellent image of Edgar Wallace, showing him head and shoulders in profile with hat and with his trademark long cigarette holder. He casts a dramatic shadow on the otherwise featureless backdrop. The photograph is undated but from Wallace's appearance it is circa 1928. Signed photographs of Edgar Wallace are rather rare.